OnePlus 6T is coming to India on October 30 and the tickets for the launch event will be released on October 17. However, the smartphone is already available for pre-booking on Amazon India's website. OnePlus 6T is coming to India on October 30 and the tickets for the launch event will be released on October 17. However, the smartphone is already available for pre-booking on Amazon India's website. Amazon India is giving away various offers to those who are booking the OnePlus 6T. 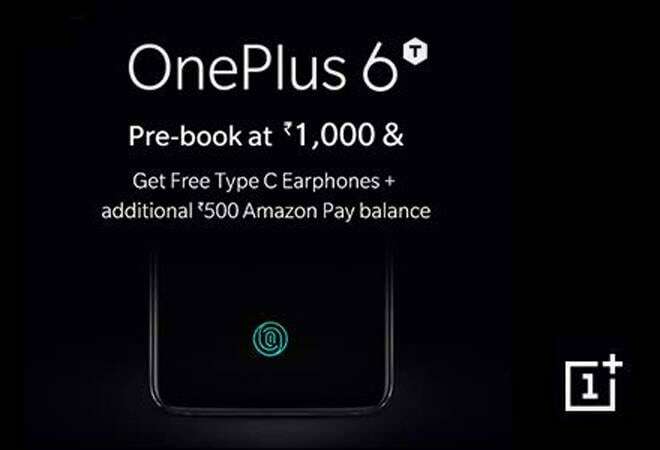 Customers can pre-book the new OnePlus 6T with an Amazon Pay gift card worth Rs 1,000 and get the 'Type C' Bullet earphones worth Rs 1,490 for free. Over and above that, the buyer will also be entitled to a cashback of Rs 500 Amazon Pay balance. The e-commerce giant will be offering options like Amazon Pay EMI and No Cost EMI. To make the deal better customers can avail the exchange offer and also get a free screen replacement. The company will start shipping the device from November 2. For those interested in attending the OnePlus 6T launch event, the company will be selling tickets at a price of Rs 999. Those in the attendance will not only get to look at the OnePlus 6T in person but also get a Bullets Wireless and a OnePlus merchandise goody bag at the event. The ticket sale will go live on October 17 at 10 am. The OnePlus 6T will trade the headphone jack for an in-display fingerprint sensor which the company calls Screen Unlock. The confirmation was made by the company chief Pete Lau himself. He claimed over 59 per cent of OnePlus community own wireless headphones and that more people stand to gain from this move than lose. The OnePlus 6T will also come with a much higher screen to body ratio, thanks to the water-drop notch. Other than these two new features, the phone is expected to carry the same internals as the OnePlus 6. The primary camera module is still a dual-lens setup but the front camera is expected to come with an IR sensor.